The Family-run Tobacconist Farm Camping and Caravan site is set in open countryside, only a few minutes walk from the historic Cotswold market town of Minchinhampton. We are situated in area of Outstanding Natural Beauty and within 10 minutes of a large area of ancient National Trust common land which provides stunning views of the five valleys. We are conveniently located for activities including golf, cycling, walking, gliding and horse-riding and you will be spoilt for choice with many traditional country pubs offering local ales and good food. Our site is opening in Spring 2012 with 20 large pitches (many with mains electric hook-up) and brand new washing, shower and toilet facilities. The camp-site itself looks out over open farmland and guests can enjoy firepits and barbecues. We run a small working farm with free-range cattle, pigs, chickens, ducks and donkeys. Our farm shop is stocked with everyday camping essentials, our own meat, eggs. Camping is available from Easter to September 30th. Pitches cost from £15 per night with no hidden extras. We can offer a special rate for groups who wish to book out the entire campsite for a weekend. Minchinhampton is one of the Cotswold's treasures - a beautiful Gloucestershire Market Town situated on a hill top, 4 miles east of Stroud. We are lucky enough to have the most incredible period architecture and history, picturesque walks, stunning scenery, wide ranging sporting activities and many local amenities. 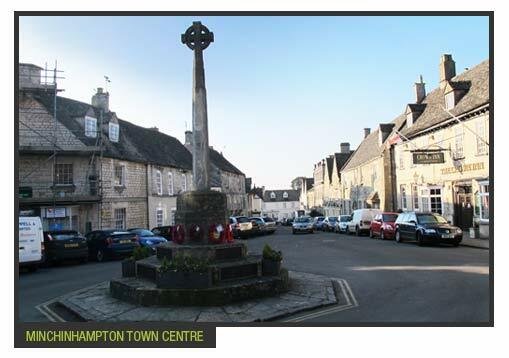 The heart of Minchinhampton is almost unaltered with its narrow streets and cottages of mellow Cotswold stone. It is ideally located in the Cotswolds with Bath and Cheltenham easily accessible. Recorded as 'Hampton' in the Domesday Book, it was given by King Harold to William the Conqueror. The town gained a market from 1269, during the Middle Ages it became a centre for sheep farming and the wool and cloth trades predominated. The expansion of the town occurred during the 17th century when many fine buildings were constructed including the handsome Crown Hotel and the Old Post Office which is a genuine Queen Anne building. The Market House is a seventeenth century stone building, set on pillars with shaded shelter below for the sale of dairy produce and public rooms above, it is a fine example of its type. On Thursday mornings there is a bustling Country Market, where local fruit and vegetables, local produce and homemade preserves, cakes and savouries can be purchased. Minchinhampton is surrounded by some of the most beautiful common land in the country where horses and cattle roam freely. The National Trust bought Minchinhampton Common before the second world war which together with Rodborough Common makes up nearly 1000 acres of high open grassland and woods which are host to a diverse range of flowers, some unique to this limestone upland. The Common is pockmarked with a variety of earthworks from Neolithic barrows and old quarries to modern day golf bunkers. Evidence of pre-Roman settlement can also be seen. The Holy Trinity Church dates from the 12th century and is cruciform, with a central tower topped by a truncated spire with a 16th century coronet. The transept is 14th century and the church spire can be seen for miles. The church is a stunning grade 1 listed building which is lit at night to highlight its spire and historic architecture. The town itself has a selection of shops, a library, chemist, a doctors surgery, primary school and two golf courses. There are several cafés, restaurants, local pubs to cater for a variety of tastes.